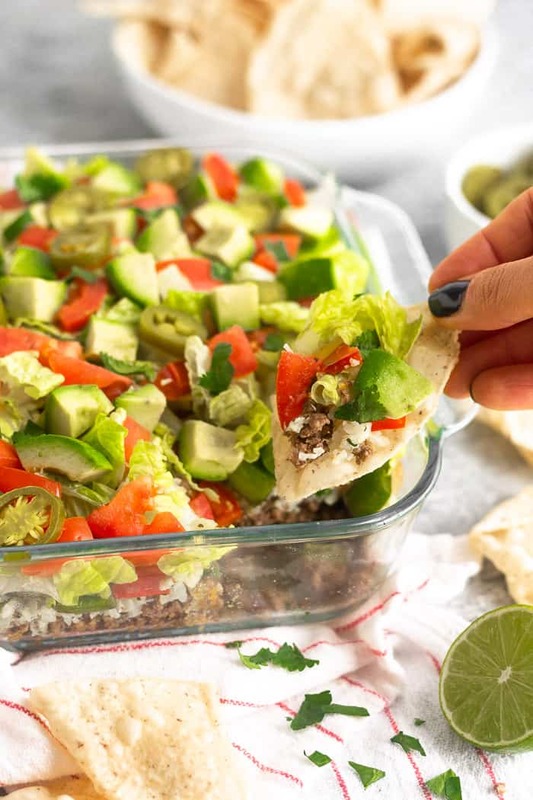 A paleo spin on your favorite 7 layer dip – loaded with beef, cilantro lime cauliflower rice, fajita veggies, lettuce, tomato, and more. A must have for game day! 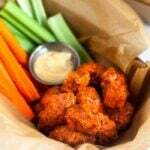 One more recipe before the Super Bowl! And what’s a football party without 7 layer dip?! 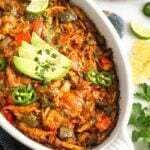 I shared a fun chicken enchilada dip earlier this week, but couldn’t resist sharing another dip. I said it on Tuesday, but I could probably live off chips and dip. There are just so many different kinds and flavors, you can’t go wrong. 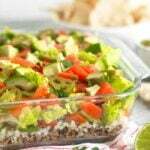 But 7 layer dip has been a favorite of mine since I was a child. 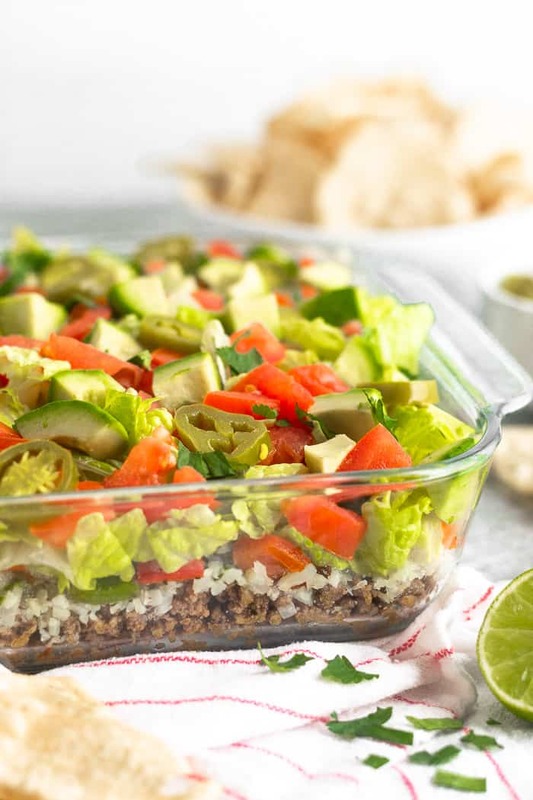 Growing up my mom made 7 layer dip quite often. When we were younger at the parties they hosted/we went to. And as we got older at sporting events and football tailgates. I remember I would always request it if the opportunity was coming up. She actually made it a few different ways (sometimes vegetarian, sometimes with meat), each way being just as delicious as the last. 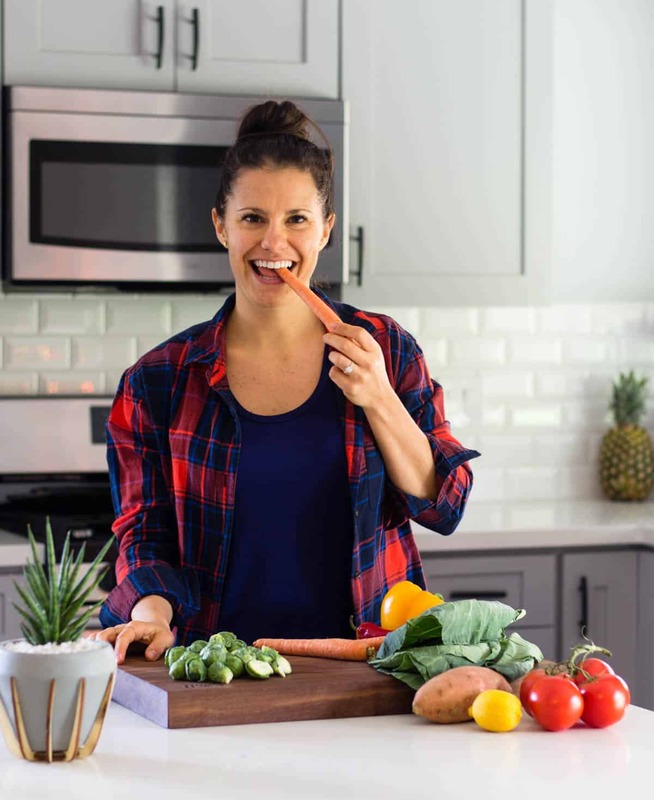 It is one of my absolute favorites and today I am sharing a Whole30 and paleo version. The way you make the recipe is exactly how it sounds, in layers. First start off with cooking the beef with taco seasoning. Once it is browned and cooked through, add it as the first layer to a pan. 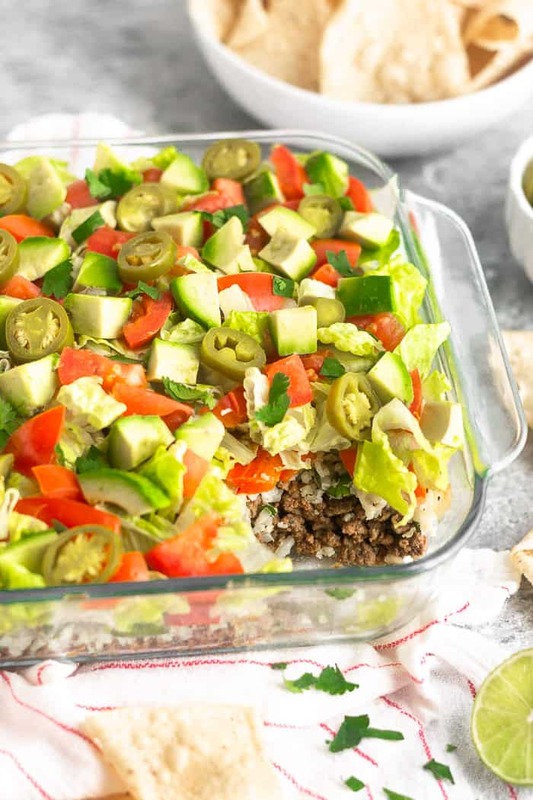 Next you cook the cilantro lime cauliflower rice and layer it over the beef. After that you make the pepper and onion mixture and add it to the dish. 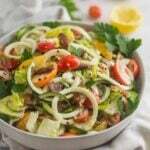 Cover pepper and onions with a layer of romaine, diced tomatoes, avocado, and pickled onions and that’s it! I added some more cilantro on top, but it isn’t necessary. Can I use a different meat? Yes! 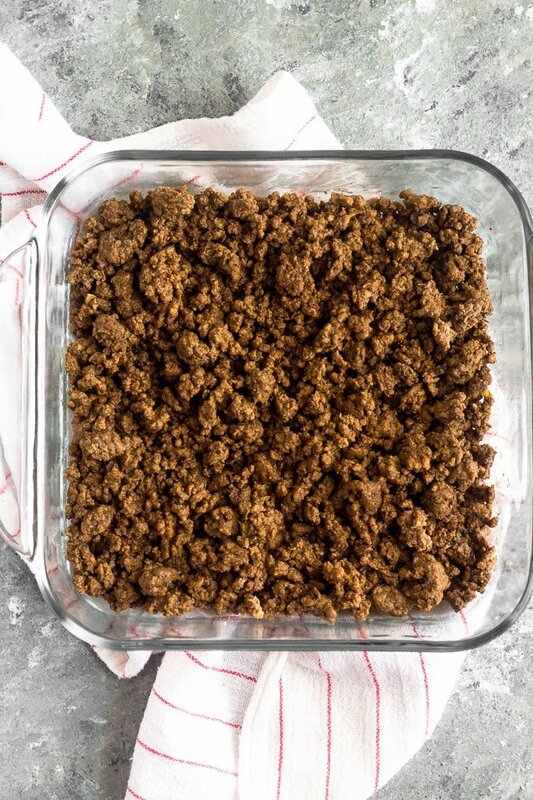 Honestly any kind of ground meat will work – chicken, turkey, sausage – whatever you like. 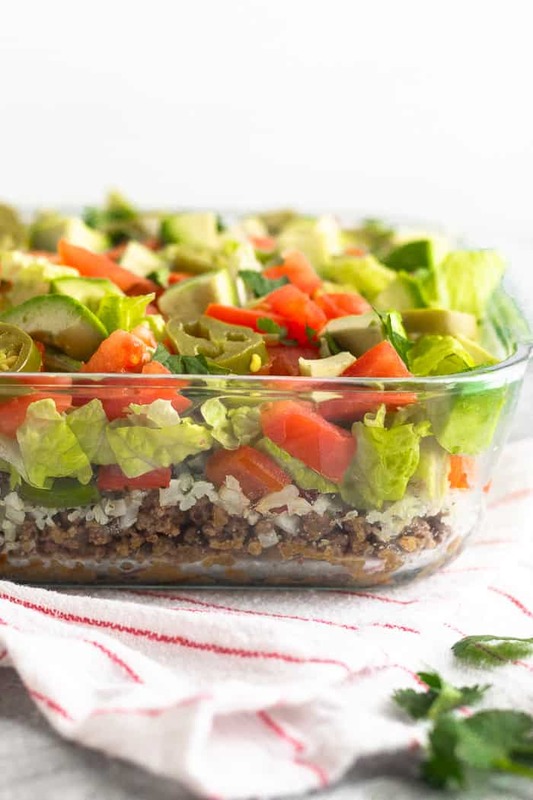 The taco seasoning gives it the classic Mexican flavor you are looking for so any kind of meat will work. 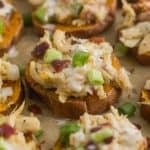 You could also sub shredded chicken as well! Can I make this beforehand? 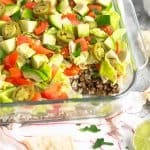 You can totally make this a day before, I would just hold off on putting the avocado in it until you are ready to serve. The avocado will get brown if exposed to the air for too long. If you want to make it a few days in advance, I would make all the components and then assemble before you are going to eat. If you have leftovers, it stores well in the fridge in a tightly sealed dish. It kept in our fridge for 5 days with it completely assembled – avocado and all. with a fork! 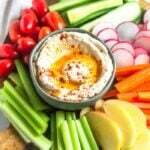 Honestly, when I shared on Instagram, someone suggested just putting ranch dressing over it and eating it like a salad haha! 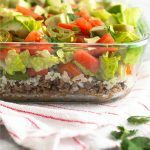 A paleo spin on your favorite 7 layer dip - loaded with beef, cilantro lime cauliflower rice fajita veggies, lettuce, tomato, and more. A must have for game day! In a large sauté pan over medium heat, add ground beef and sauté for 7 minutes until browned, adding taco seasoning and salt and pepper halfway though. Transfer into an 8x8 dish (I like to transfer the juice too as it has a lot of flavor). 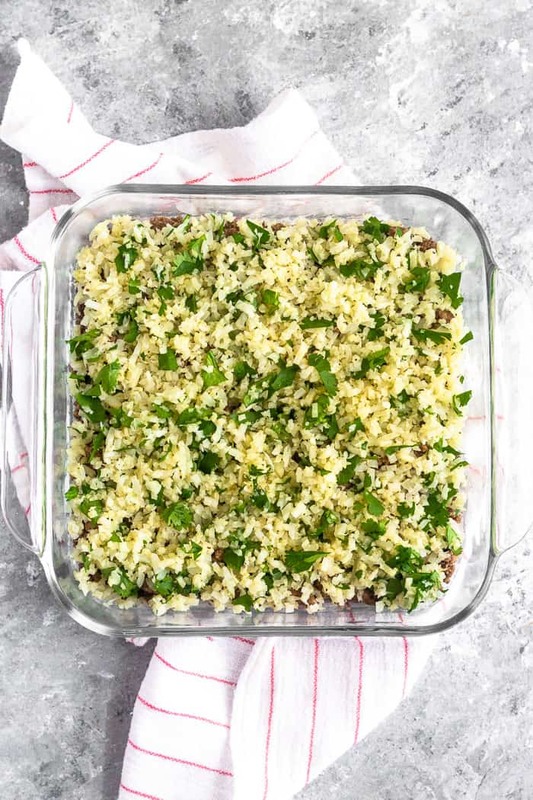 Add cauliflower rice to pan and cook for 4-5 minutes until softened. Stir in cilantro, lime juice, and salt and pepper and distribute over top of beef, spreading out evenly. If needed, add 1 teaspoon oil to pan. Add onions and sauté for 3 minutes. Add peppers and salt and pepper and sauté for another 3-5 minutes until softened. 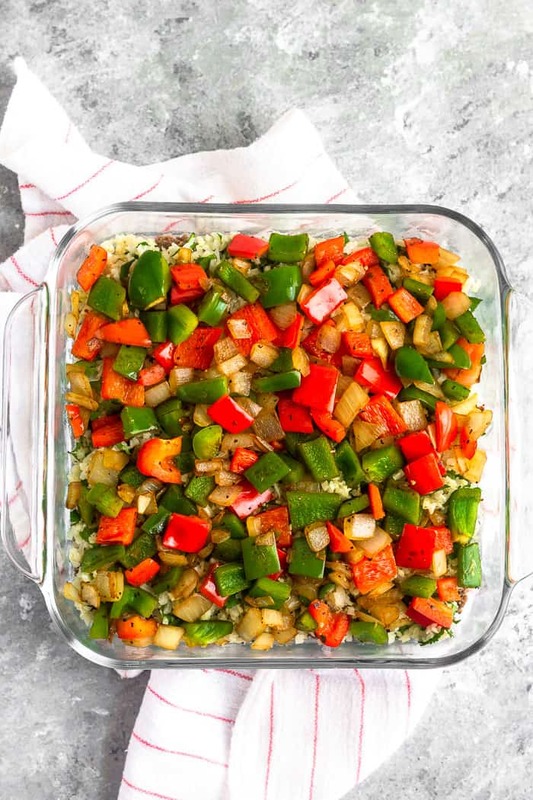 Layer on top of cauliflower rice. 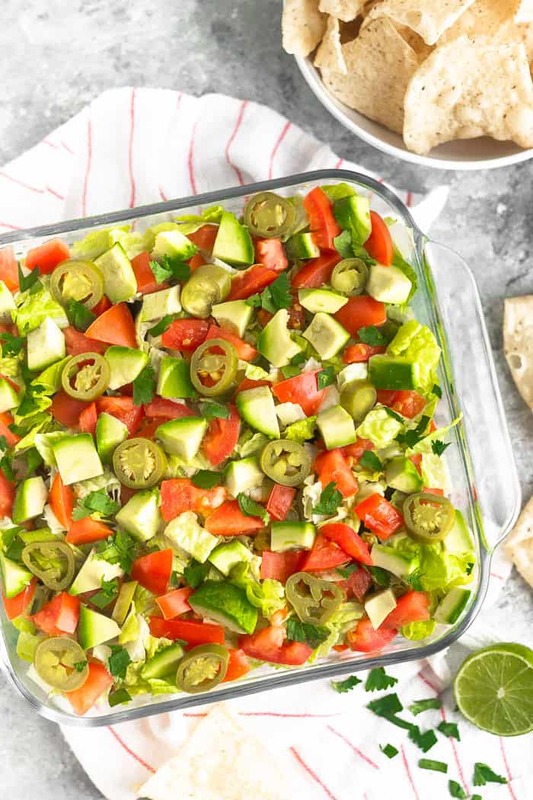 Cover peppers with a layer of romaine, then tomatoes, avocado, and pickled jalapeños. Garnish with fresh cilantro and enjoy! Yes! I think we need to have her make it again!